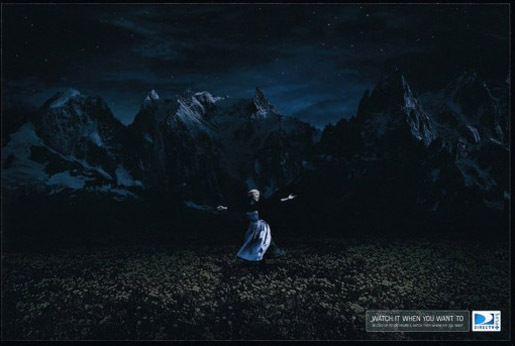 DIRECTV promoted DIRECTV Plus in Colombia with “Sound Of Music”, a print advertisement showing Julie Andrews’ character Maria singing in the dark. “Watch when you want to”. Sound of Music was developed at Leo Burnett Colombia, Bogota, by executive creative directors Carlos Murad, Otavio Schiavon and Rodrigo Davila, creative director/art director Fernando Hernandez, creative director/copywriter Mauricio Sarmiento, copywriter Christian Duran, art directors Fabio Mendoza and Juliana Forero, with retouching done at Zumo. Sound of Music won a Gold at the London International Awards.